Days turned into months, months into years. Now the owner of the building and the owner of the bar — two different players caught in an unexpectedly long-running drama of rebuilding, waiting, more rebuilding and more waiting — are saying what they have said before: It won’t be long. The owner of the bar is Jim Miller, a firefighter who started as a part-time bartender and ended up running the establishment. He said he hoped to have the taps flowing by the end of the year. 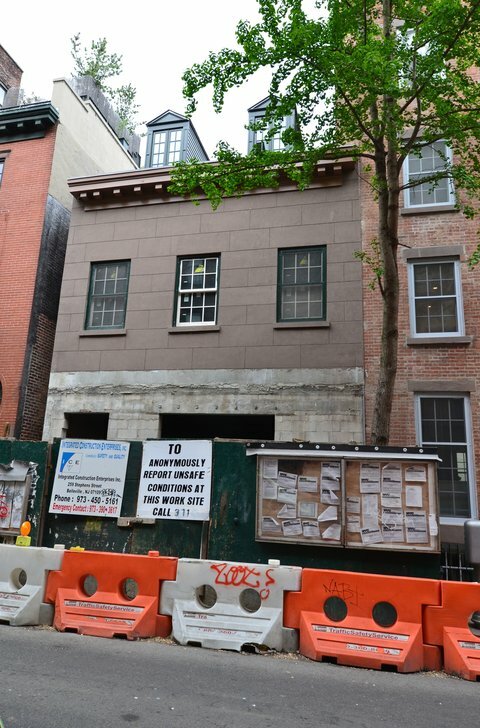 “I think everyone’s looking to see the end in sight,” she said, “and I hope with the summer months, we will complete all exterior work and be in a position to allow Chumley’s to do the interior fit-out that they are so keenly interested in doing.” By that, she meant completing the kitchen and the plumbing and bringing back the bar, the tables and the photographs and book jackets that were on the walls. All of that property was lovingly packed up and put in storage in 2008. Chumley’s, a speakeasy during the Depression, had a reputation as a literary hangout for John Steinbeck, E.E. Cummings and Norman Mailer. It was also a favorite for generations of New York University students, and remains a destination for tourists with maps and guidebooks who wonder at why they cannot walk in and order a beer.